The Trinity GAP Pet Fair is Saturday, Sept 30th, from 10:00 to 2:00 at Trinity High School, 500 N. Industrial Blvd. in Euless!! (The Garage Sale starts at 8:00 so come early for all the good stuff and then stay for the Fair! ) 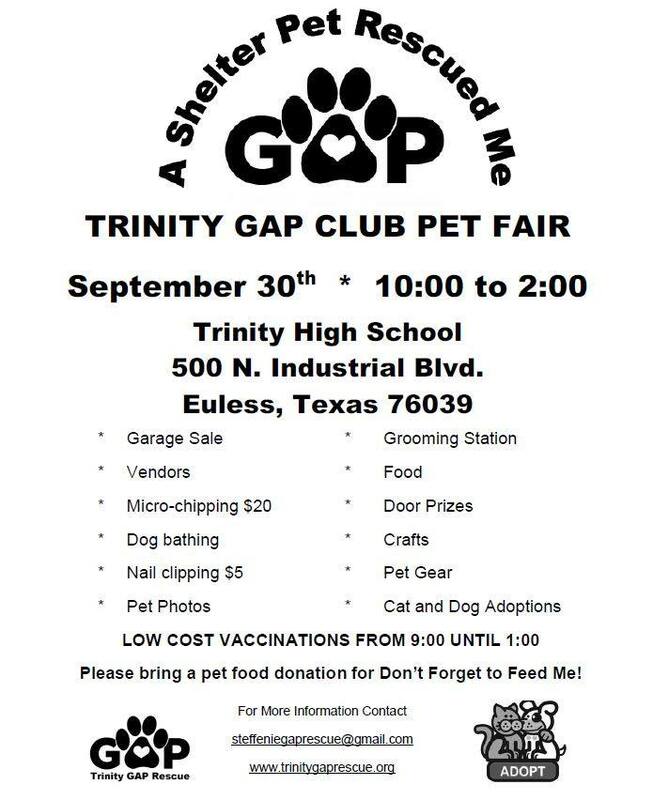 The pet fair is hosted by the Trinity High School GAP Club, (Girls Awareness Program) which is an all girls’ community service organization that sponsors the Euless Animal Shelter. Last year approximately 300 dogs and cats found homes with the help of Trinity GAP. The fair is lots of fun for everyone of all ages and is pet friendly if your pet is leashed and friendly too! Bring your pets for low cost vaccinations thru Texas Coalition for Animal Protection aka TCAP (from 9 until 1), $20 micro-chipping thru Great Dane Rescue of North Texas, Inc., beautiful Pet Photography by James Stevens Photography for only $10, dog bathing, nail clipping , raffles, vendors, food, pet adoptions and more!! All proceeds funnel into the Trinity GAP Club vet fund to help Euless Animal Shelter pets. The fair will go on rain or shine! Oh and please bring a pet food donation for Don't Forget to Feed Me Food Pantry!! Don’t Forget To Feed Me keeps owners and their pets together by providing pet food to those in need in the North Texas area! Many Euless Shelter/GAP Rescue Pets will be at the Fair and up for adoption!! Check out all pets here: http://trinitygaprescue.org/ See you Saturday--Rain or Shine!! !